BobGoyetche.com | What’s a 100 among friends? What’s a 100 among friends? Way back before the beginning of time (Aug/Sept 2004).. I discovered podcasting. I was thrilled to see the promise this new distribution method had, and it hooked into my love of all things audio and radio. I remember calling by lifelong friend AJ and telling him about this new thing. AJ and I live very different lives, I’m heavily into technology, and he isn’t. The way I was able to boil it down for him was to explain that it’s radio over the net. That’s all I had to say – we were putting the studio together in my basement within weeks. AJ and I had done pirate radio together in the early 90’s, and even tried to go legit by trying to get a community broadcast license from the CRTC (Canada’s FCC-ish Borg).. Of course the paperwork and hoops would prove to be too much for us, and the dream died there and then. Technology then caught up to our wishes, and via podcasting we found the (legal) outlet we were looking for. 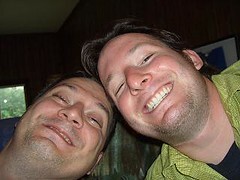 Here we are in 2008, and The Bob and AJ show just put out it’s 100th podcast episode.. If we were to count all those pirate broadcasts on CNOT-FM, that would put us at least around 150. We took 2 breaks, from 92-04 and 6 months or so in 06-07.. Yet the friendship itself never took time off..
100 episodes isn’t a big deal anymore, many podcasters have reached that goal (hell Chris Penn is over 800!). But it has truly been a blast to “work” with AJ for all these shows, and even more, it’s been a blast to call AJ my friend for around 25 years. No matter what you do, it’s oh so much better if you do it with people you love. Happy 100th AJ, let’s keep doing this, ok? This entry was posted in General and tagged , bob-and-aj. Bookmark the permalink. Follow any comments here with the RSS feed for this post. Both comments and trackbacks are currently closed.